The Dow Jones Industrial Average (DJINDICES:^DJI) is one of the most iconic and widely followed indexes in the world, even if the S&P 500 arguably provides a more encompassing view on the health of the U.S. economy and business in general. It contains 30 giant multinational business titans that that Wall Street and investors tend to follow very closely. Over the trailing-12-month period the Dow is essentially flat. However, just because the Dow isn't moving doesn't mean the 30 stocks that comprise the iconic index are standing still. Over that same period, four components are down by at least 10%, with another eight up by a double-digit percentage. The performance for many of these companies probably come with little surprise. For instance, technology bellwether IBM is down 10% over the trailing year, which should surprise no one, as its revenue has been in a precipitous decline for years. Conversely, Visa's 19% rise over the trailing-12-month period is business as usual for the payment processing facilitator that's grown full-year EPS by a double-digit percentage in five of the past six years. What's particularly jaw-dropping, though, is what company currently sits at the bottom of the heap as the Dow's worst performer over the trailing 12-month period, and which company stands atop the other 29 Dow components as its best. Quick, can you name the Dow's top performer over the past year? Did you come up with McDonald's (NYSE:MCD)? Following a period of four years (August 2011-August 2015) where McDonald's valuation essentially remained static and the Dow generally kept trudging higher, McDonald's shares have exploded to the upside by 37% over the past 12 months. In terms of market value, we're talking about seeing the Golden Arches pack on about $30 billion in extra heft. Two major catalysts have been responsible for McDonald's resurgence -- and they both come down to the fast-food restaurant giant listening to its customers. First, McDonald's introduction of an all-day breakfast menu has been an overwhelming success. Previously, McDonald's had held off on making the move to all-day breakfast on account of space and time constraints. Either there wasn't enough space within its kitchens to put breakfast equipment, or the time it took to cook breakfast was believed to slow down drive-thru lines. But consumers wanted breakfast options, and that's what they're now getting. McDonald's has witnessed a resulting uptick in breakfast add-ons during lunch and dinner hours, which are driving up ticket prices and profitability. In McDonald's first quarter, U.S. comparable-store sales rose by a healthy 5.4%. The other issue was the removal of its $1 value menu and the introduction of a new value menu with items that were as high as $5, which angered many cost-conscious customers. Instead, the Golden Arches introduced the McPick 2 menu, allowing consumers to pick two of four items for $2. By giving the consumer a new sense of value, they're once again flocking back to McDonald's. On the other hand, the Dow's worst-performing stock over the trailing-12-month period is up more than 1,000% over the past decade,and was an instrumental component in leading the index to its all-time high-water mark in 2015: Apple (NASDAQ:AAPL). Yes, Apple! As one of the few Dow stocks to find itself in bear market territory (defined by Wall Street as a drop of 20% or more from recent highs), Apple shares have shed 24% of their value over the trailing-12-month period. This works out to approximately $170 billion in lost market value. For even more context, the amount of market value Apple has lost over these past 12 months is higher than the value of 477 out of 500 S&P 500 companies. What we're likely seeing is investors coming to terms with the fact that Apple is now a slower growing and mature business. In its most recent quarter we saw iPhone sales drop for the first time in history, and Apple's $50.6 billion in sales marked its first year-over-year sales decline since 2003. Furthermore, with the exception of the upcoming iPhone 7 release, there really aren't any catalysts to clamor over until perhaps the release of the iCar later this decade, or at the beginning of next decade. Investors are taking a step back and suddenly realizing that Apple is fallible after all. Of course, it's worth pointing out that Apple's "struggles" are probably being taken out of context. Apple still generated $11.6 billion in operating cash flow and authorized an increase to the company's capital return program to shareholders of $50 billion. This boosts Apple's capital return to a cool $250 billion overall. Not to mention, inclusive of overseas cash, Apple's cash pile has increased to $230 billion. Long story short, Apple's probably going to be just fine. Whether you find these moves surprising or not, there's one thing you should always keep in mind when reviewing the performance of Dow and S&P 500 components: their long-term outlook. It's pretty easy to pick on Apple and be downbeat on its performance over the past 12 months. But expand those dates a bit and you can see that Apple has created far, far more shareholder wealth than it's destroyed over the past three decades. In fact, it's left the Dow Jones Industrial average in the dust when you put the two side by side. 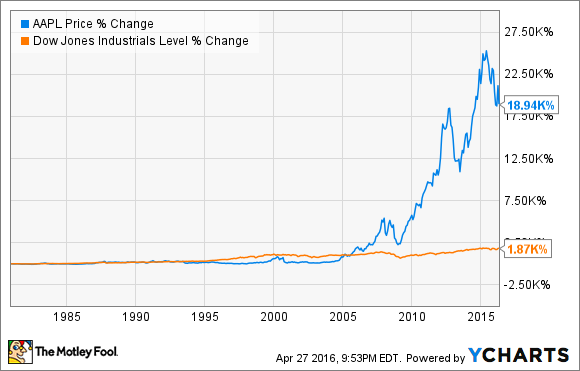 The same can be said for many of the Dow's components, and even of the Dow Jones Industrial Average itself. If you buy into the index, or individual companies within the index, and you hold them over extensive periods of time (five, 10, or 20-plus years), history has shown that you tend to do pretty well. Naturally, history is no guarantor of future results. But since we're talking about 30 leading multinational companies within their respective industries, chances are there could be some great investment opportunities to be had within the Dow.